Discussion in 'Controller Boards' started by tazma, Jan 8, 2019. There is no power supply shown connected on the drawing? You have no ground wire from the (invisible) power supply connected to Arduino ground pin. You should probably use pull-up resistors on the arduino. Are you using grbl firmware? I'm going to keep this simple so Google Translate can do a good job if it needs to. Here's my actual working setup before I start putting it in an enclosure. I hope you can follow it! In the third image, you can see the Y axis STP/DIR wires go into a plug in the top left. After that, the black and yellow wires become black and green. Currently, the white ENABLE wire is disconnected from the Arduino (steppers are always active). I do not have stepper power ground connected to logic ground. All stepper driver grounds are daisy-chained together and then go into pin 14 from the X driver. Blue wire (pin 11) and white wire (GND) deliver TTL PWM to the laser driver. [QUOTE = "Christian James, post: 75325, miembro: 113444"] ¿No se muestra una fuente de alimentación conectada en el dibujo? 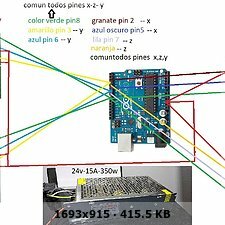 No tiene un cable de tierra de la fuente de alimentación (invisible) conectada al pin de tierra de Arduino. 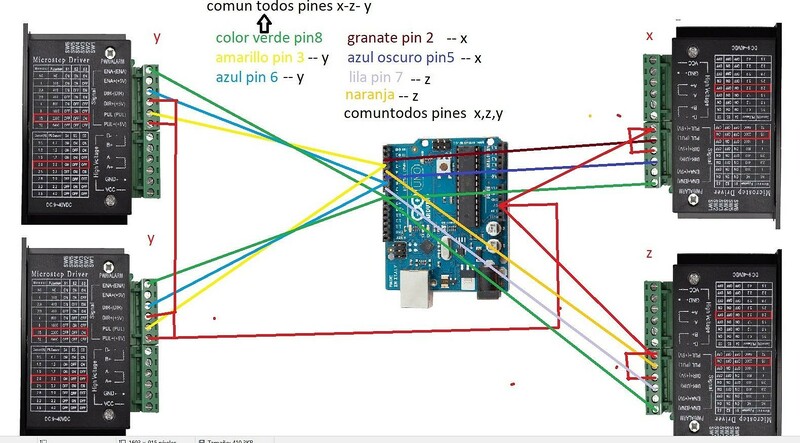 Probablemente deberías usar resistencias pull-up en el arduino. ¿Está utilizando el firmware de grbl? Que tienes el eje Y puenteado ??? Steppers: 24V. Last photo, red and black wires, top left, into black and yellow wires daisy-chained across all drivers. Yes, Y axes are bridged, the blue and green wires in the third photo connect the STP and DIR signals. One of the motors is plugged in backwards so it turns in the correct direction. Steppers: 24V. Última foto, cables rojos y negros, arriba a la izquierda, en cables negros y amarillos encadenados a través de todos los controladores. Subo foto de lo que logré descifrar. Yes, I was trying to keep the wiring as simple as possible. Much clearer to see and perform surgery! [QUOTE = "Rob Taylor, post: 75370, miembro: 287"] Sí, estaba tratando de mantener el cableado lo más simple posible. Mucho más claro para ver y realizar la cirugía! X and Z should continue as they are. X PUL/DIR into pins 2 and 5, Z PUL/DIR into pins 4 and 7. You can continue the chained black/yellow power supply wires through each of them too. At some point, I'm going to get my white ENA wire hooked back up to pin 8, but it was giving me problems so I didn't do it already. I just need to get grbl configured right to make it work. Voy a comentar el resultado. If you want to do step on low, maybe, but that's not the way mine works. I'm guessing ENA+ would go to Arduino +5V too. I'm not sure, I was just showing my setup.